My Commute | Where Is Annie? We stayed in an apartment looking over the river in Siem Reap when we were in Cambodia. A road tracked along both sides of the river. Most mornings I sat on our deck overlooking the river and the road. I watched as people laid nets zigzagging across the river. I watched as a pack of three dogs did their morning rounds looking for good smells and eats. And I watched the commuters on their way to work or school. Very few cars passed by in the mornings. There were some on motorbikes, but most of the commuters were on bikes. Often there were two or three to a bike. Many wore school uniforms. Some carried a mountain of goods strapped to their bikes. There were dozens of styles and makes of bikes. My favorite was a common all pink bike, including the rims. 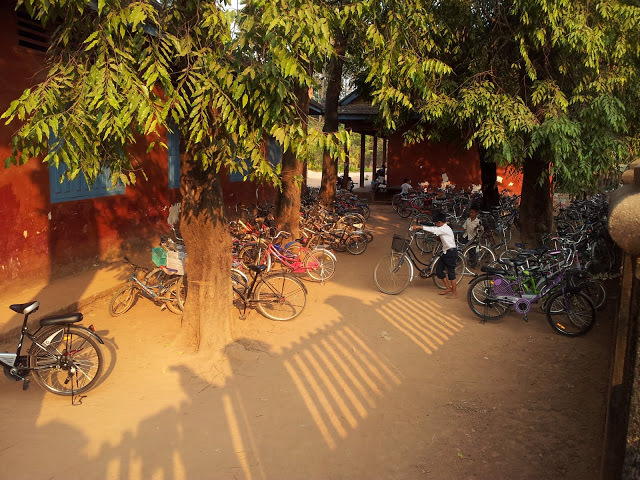 When we got home I continued the way of the Cambodians and have biked to work. I’m lucky, I don’t work very often. I work 24 hour shifts only six times a month. Before we left on our trip I only had to get to work six times a month. But my job as medical director has become more demanding. I’m often at the hospital four, sometimes five times in a week attending meetings. Still, I have driven to work only once this year. Early on a Sunday. BART wasn’t running yet. My commute brings me too much joy to miss out and drive. When I used to drive to work I left 45 minutes before I was supposed to arrive (9 am). The drive without traffic is only 25 minutes. But there’s always traffic. I usually got to the door right at nine. Now I leave at 7:50. I get to work at 8:50. I have time to get ready, and I’ve had a wonderful time getting there. 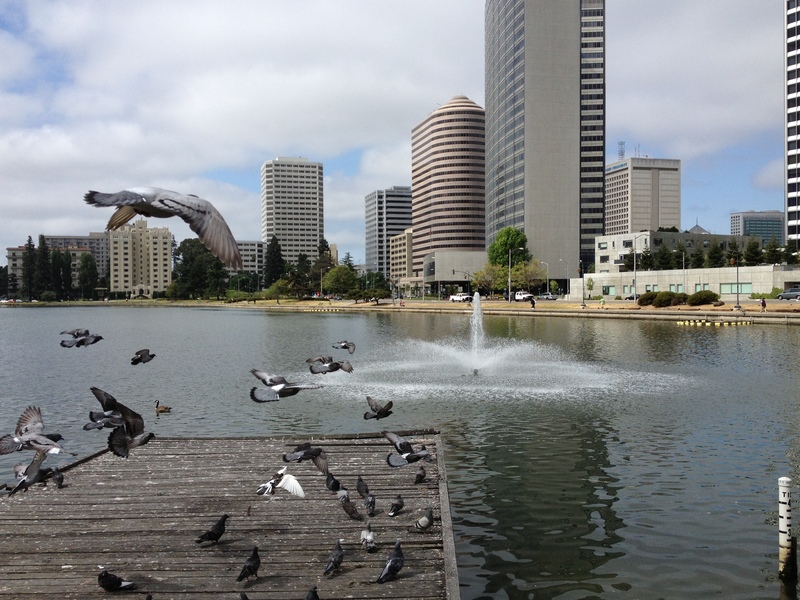 I start my commute riding past Lake Merritt. Lake Merritt is a tidal lagoon, and when the tide is high, the water bulges against the stone walls holding the lake in. The lake feels swollen. Fountains grace the corners of the lake where the underground streams add their water and silt to the lake. The fountains help keep the lake clean and aerated. They sparkle when the sun is shining, and I feel the sparkle as I start my day. Ducks, geese, pelicans, and coots float on the lake looking for edibles growing under the water or fighting for edibles thrown in by a kid with a stale loaf of bread. The lake is the nation’s first wildlife refuge, and birds come to roost and to breed and sometimes stay. In the spring the cormorants build dozens of oversized nests in the dead tree branches on the islands. Goslings follow their Canada geese parents through the grass looking for bugs. Dozens of egrets turn a portion in of the lake into a delicate patch of white during their spring migration. 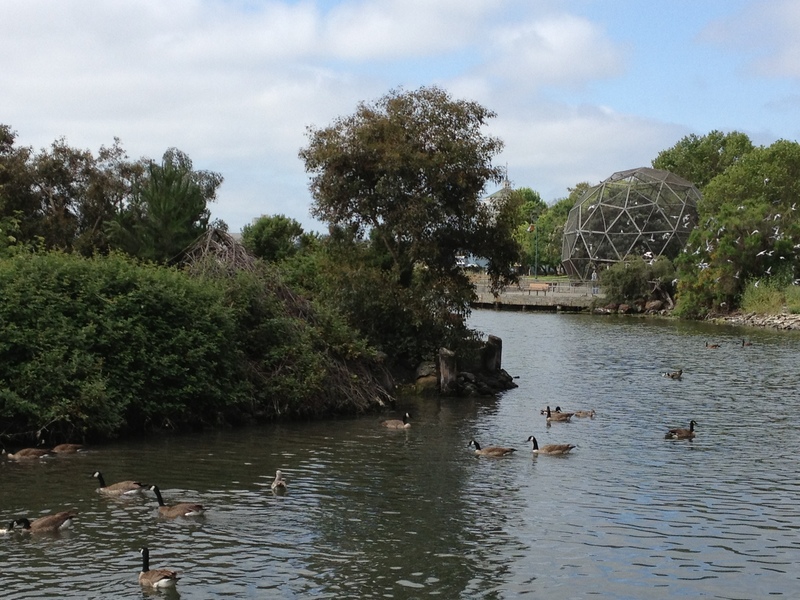 Buckminster Fuller’s first geodesic dome now houses sick and injured birds on the shore. These are the things I see as I ride along the path. But it’s not just birds who visit the lake. Oakland is an amazingly diverse city with people coming to live here from all over the world. All of Oakland descends on Lake Merritt to be outside and exercise. While riding I get to listen to Spanish, Vietnamese, Arabic, and Tagalog. I’ve watched as elderly Chinese women dance to a boom box playing traditional Chinese music. Gorgeous muscular runners use the lake as a gym as do women in their early morning boot camps. Groups of fit rowers skim the lake in skulls while groups of older rowers, wearing matching white caps and blue scarves, plow across the lake in rowboats. There is one older, African American gentleman who is always there when I ride. He is sometimes with a friend, sometimes alone. He limps a little and always sports his white newsboy hat. I always nod and smile at him. He nods and smiles in return. 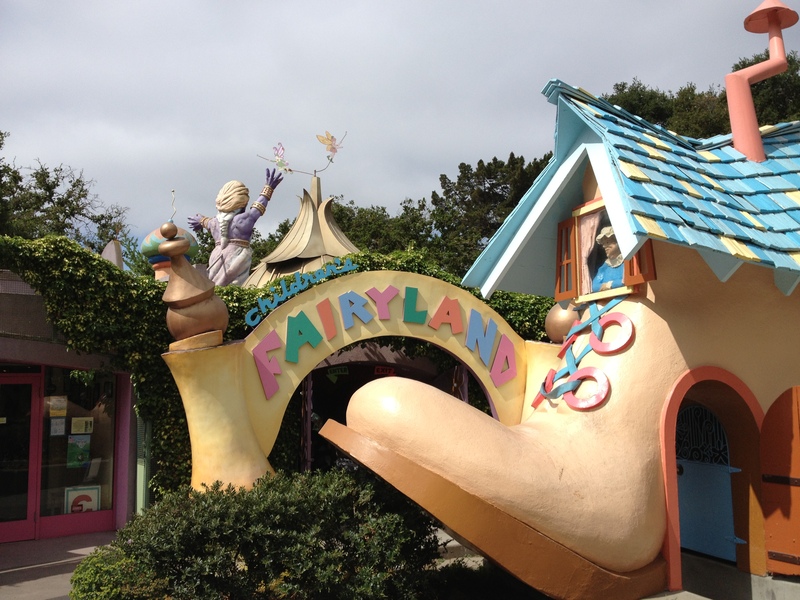 I ride past Children’s Fairyland, the amusement park which inspired Walt Disney to build Disneyland. 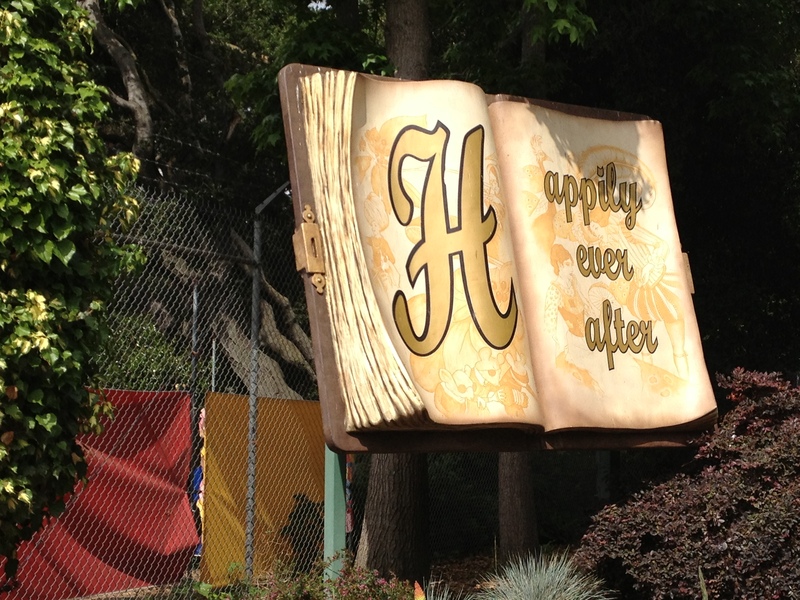 The park is full of fairytale themed rides and playgrounds. From the path I get to see the merry-go-round with characters from Alice in Wonderland as its seats, the queen, the caterpillar, and the Mad Hatter, are waiting for a kid to climb on and laugh. It’s early when I ride past, and the park is not yet open. The donkey who decorates Pinocchio’s home is out gnawing on the grass of the field where the birthday boys and girls will later picnic. He is often joined by a llama. And then I arrive at the BART station. I carry my bike down the stairs and am almost always greeted by music. Sometimes an older man is singing tunes from the 40’s a capella in a baritone. Sometimes a Mexican man wearing a cowboy hat and cowboy boots is singing traditional songs while playing an out of tune guitar. I am reminded remotely of the vast amount of music in Guanajuato. It was much better there. A Peruvian sometimes plays guitar and blows on his pan pipe. He once was playing “Hotel California”. I sang that song to karaoke at a Christmas party in Thailand. If I have a dollar in pocket I donate it to the artists. The train ride takes less than 30 minutes. It is my time. I get to catch up on my reading. There are always journal articles to read, although more often I read a good book. I’ve read about the collapse of the Incan Empire and the discovery of ancient Roman texts while on BART. I’ve learned a lot while sitting on the train. Still sometimes I just watch the scenery. I admire the old theater marquee in Orinda or honor the war protest memorial in Lafayette. There are thousands of crosses commemorating all of the American soldiers who have died in Iraq and Afganistan. Since it’s the reverse commute, I always get a seat, and my bike is rarely folded. 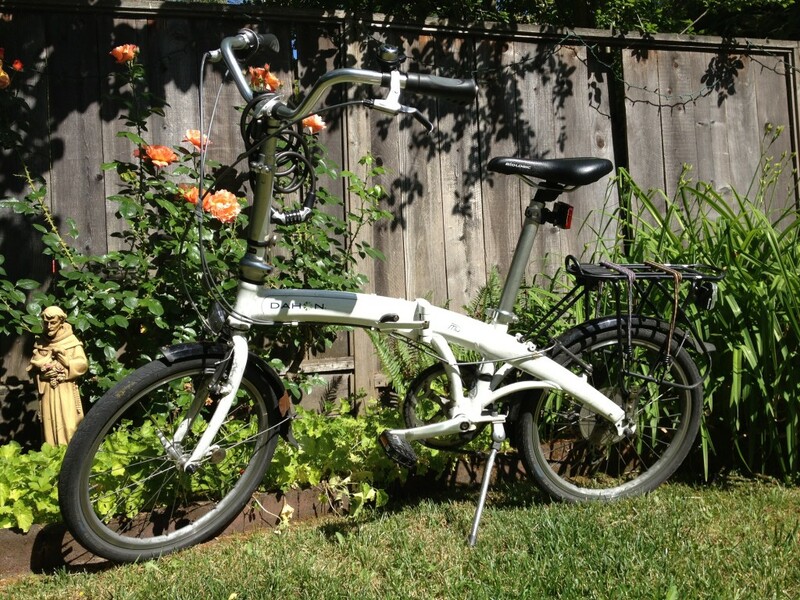 Yes, a folding bike. It allows me to take BART whenever I want. My kids are embarrassed by it. They have yet to understand the adult need for function above style. When the train ride is over I have another two miles to ride, from Pleasant Hill station to the hospital in Walnut Creek. It’s all on bike trails, mostly along a canal. I get to hear frogs croak and watch ducklings learn to swim. I watch as the morning fog burns off in Walnut Creek long before the sun shows its face in Oakland. 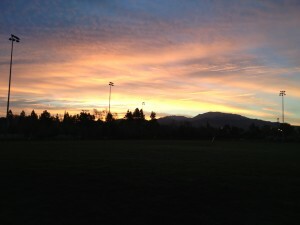 I watch the sky change color over Mount Diablo as the sun rises. By the time I arrive at the hospital I have spent half my time commuting on my bike. I’m high from the exercise. I’m not mad at anyone for cutting me off or stressed out that I didn’t pick the fastest lane through the tunnel. Even if someone frustrated me on my travels I quickly forget about it as my legs stroke out another round with the pedals. There’s a certain lightness of being on my bike as I stand up in the perfect gear riding up an easy hill. It’s like walking on tiptoes, but flying. I’ve been taking this route for years, but this year my bike has become my dominate mode of travel. I am happier than ever with this choice. Sure it’s wet in the rain, but I bought a pair of designer rainboots at a resale shop. Now I get wet in style. I change into scrubs when I get to the hospital. I’ve fallen as well. Once in the winter as I turned onto the wooden bridge in the park in Walnut Creek. It was covered in frost, and I slid on my thigh for five feet. I arrived at work with a big bruise on my thigh. 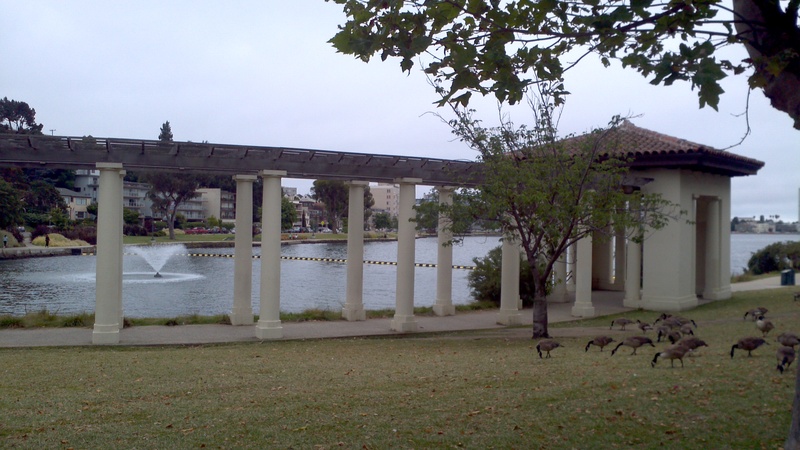 And once in Oakland as I turned onto the gravel path by Lake Merritt. 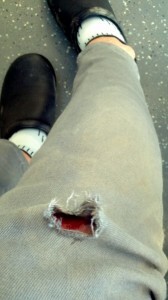 I fell on my knee and arrived at work with a hole in my new jeans and a bloody knee. Small dings that are just part of the story. We sold my car before we left on our trip. We now only have one. We’ve been forced to get around on our bikes more. Cat rides her three miles to school and home again almost every day. I often accompany her. It’s a time we can talk. Or not. It’s mostly a time to just be together. Recently, though, she’s wanted to ride alone. She’s a teenager now. She doesn’t want to be seen with her mom on a folding bike. Bill has been riding to his office downtown. He now feels uncomfortable driving to places as bikes whiz past our car. Only Hank is committed to the car. He’s 15. He just got his learner’s permit, and he’s learning to drive. On a twelve year old minivan. God help us. I wrote this to commemorate Bike to Work Day which is today. I want to thank my colleague, Scott, an adult hospitalist at John Muir. He lives in Berkeley and taught me how to stay out of the gym and get to work without ever using a car. Thank you, Scott.